Star Trek: Enterprise (originally titled Enterprise for the first two seasons; sometimes abbreviated to ST: ENT) is a science fiction TV series and a prequel to the original Star Trek series. The series premiered on September 26th, 2001, on the UPN television network with the final episode airing on May 13th, 2005. It was the last Star Trek program to end its run on television. The show is set in the nearby regions of the Milky Way galaxy, beginning in 2151 (115 years before the original series) when Jonathan Archer becomes the captain of the Enterprise. It ends in 2161 with the formation of Starfleet Academy and the United Federation of Planets. 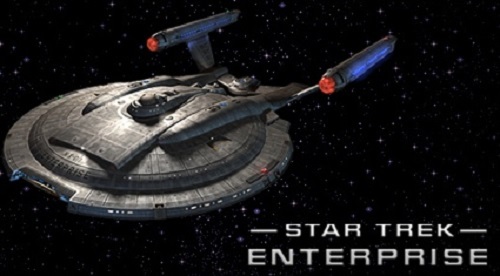 The series takes place aboard the starship Enterprise NX-01, Earth's first warp-5-capable ship, which has been designed for long-range exploration of the galaxy. One of the most important starships in interstellar history, Enterprise (NX-01) was the culmination of the NX Project. The NX-01 was the first NX-class starship, launched by the United Earth Starfleet in 2151. The Xindi-Insectoid ship was a type of warship used by the aggressive Xindi-Insectoids in the 2150s. It consisted of a small central core containing the drive system and three extended wing-like sections extending forward, mounted at 120 degree angles along the fore-aft axis. Romulan Birds-of-Prey were starships used by the Romulan Star Empire in the 22nd century. Green in color, they were so named due to their distinctive avian appearance. They were equipped with disruptor banks, as well as advanced cloaking technology. During the 22nd century, the Nausicaans were well-known pirates, attacking freighters in various sectors for years. The ECS Horizon had a run-in once with some Nausicaan pirates. The Surak Class starship, designed at Starfleet's Vulcan Starship Design Research facility (VSDR), has proven itself a more than competent medium science ship - design aesthetics play little part, however, as logic has dictated the placement of every curve (read: angle) on the ship. The Andorian cruiser was a type of small warship and support craft that was in service with the Andorian Imperial Guard during the 22nd century. The Romulan drone-ship was an advanced experimental attack starship described as a marauder and developed by the Romulans in the 2150s. The Raptor-class scout vessel was a small battle cruiser utilized by the Klingon Empire during the mid-22nd century. The Klingon Raptor was a type of scout ship first encountered by the Vulcans sometime prior to 2151. ECS Fortunate was a Y class freighter in the Earth Cargo Service fleet that operated in the first part of the 22nd century. For three generations, the Keene family served on board the Fortunate. As of 2373, the headquarters of the Klingon Defense Forces have been relocated to Ty'Gokor. The majority of Defense Force members are common warriors. The D'Kyr type was a type of Vulcan starship operated by the High Command during the mid-22nd century. Some of these vessels were given the designation of combat cruiser in the 2150s. The Xindi-Aquatic scout ship was a Xindi-Aquatic starship used in the 2150s. It was much faster and more maneuverable then the Aquatics' main cruiser. Goroth's starship was a mid-22nd century Klingon starship commanded by Captain Goroth. In 2153, Tellarite bounty hunter Skalaar docked with Goroth's starship to transfer his prisoner, Jonathan Archer, over to the custody of the Klingon Empire. The Xindi-Reptilian warship was a large warship utilized by the Xindi-Reptilians during the mid-22nd century. They were capable of maintaining operations with a crew of twenty-two. NX-Alpha was one of three test vehicles, along with the NX-Beta and the NX-Delta, used in Starfleet's NX Project, the effort to test and refine the warp five engine designed by Henry Archer. USS Enterprise (NCC-1701-J) was a 26th century Federation starship operated by Starfleet in an alternate timeline. The Enterprise-J participated in the historic Battle of Procyon V, wherein the forces of the Federation successfully drove the Sphere Builders back into their transdimensional realm. The Vahklas was a Vulcan civilian transport commanded by Tavin, the leader of its crew of V'tosh ka'tur. The vessel used a Vulcan frequency to hail other ships and was capable of visual communication. The Vahklas left Vulcan in approximately 2143. Suliban cell ships were the primary ship types used by the Suliban Cabal during the mid-22nd century. They were armed with particle weapons and equipped with cloaking devices. The ECS Horizon was a J-class cargo ship that was commissioned in 2102 and remained in service for over 50 years as of 2153. It was owned by the Earth Cargo Authority and commanded by Captain Paul Mayweather Jr.
A rocket ship was a fictional faster-than-light rocket that featured in many 20th century science fiction stories. The fictional character Captain Proton used a rocket ship which was equipped with a destructo beam. OV-165 was an orbital vehicle, a type of space shuttle, used by the inhabitants of Earth in the first half of the 21st century. This ship was seen in the opening titles of Star Trek: Enterprise as Linda Park's credit plays, right after the International Space Station (a 1990s concept), and prior to a scene of the Phoenix in 2063. A Vulcan survey ship was a type of spacefaring vessel utilized by the Vulcan High Command for conducting survey missions during the mid-20th century. Among other duties they performed were statistical scans from high orbit.